Cookware can be difficult to get right. You want something that will work for you and your family, but you don’t want anything that will be too large or difficult to care for. It should be able to handle a variety of jobs, but shouldn’t cost more than your budget will allow. So, which cookware is right for you? For those looking for something that can be used for almost everything, the T-fal B36090 Specialty Nonstick Jumbo Cooker Saute Pan will certainly fit the bill. The size of this pan makes it a great choice for a number of things: At five quarts, it can be multi-purposed for anything from curries to stews to fries. With an average price on Amazon of $24, that’s a lot of different options. But it doesn’t just stop there! This pan is nonstick, meaning that you don’t need oil or butter when cooking; this makes your foods healthier. Want to cook in the oven? It can handle temperatures of up to 350 degrees Fahrenheit, perfect for baking! It’s also completely dishwasher safe, for easy cleanup after you’re done. The only problem that can be noted is that sometimes the bottom can warp, but that hasn’t been shown in all products. At 5 quarts, this pan can be used for almost anything. Completely dishwasher safe, for easy cleanup after cooking. Oven safe up to 350 degrees Fahrenheit, for baking. Completely nonstick, so that you don’t have to use oil, butter, or anything else; this makes food healthier. At an average Amazon price of just $24, this is a low-cost, do-anything type of pan. Some warping has been seen occurring in some pans, though not all. Made of aluminum, not steel, copper, or iron, which are often considered to be stronger and more durable. 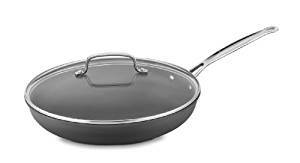 If you need a cheap piece of cookware that can do a lot of different jobs, then the T-fal B36090 Specialty Nonstick Jumbo Cooker Saute Pan is a good choice. It’s easy to clean, and, since it’s nonstick, easy and even healthy to use. It has its downsides, but still remains a good pan. When it comes to finding a skillet, for many, nothing beats good ol’ fashioned cast iron. And that’s where the Lodge Cast Iron Skillet comes into play. Like all cast iron cookware, the key feature of this skillet is the durability that it offers; it takes a lot to take out cast iron! Best of all, the iron comes pre-seasoned with oil, so you don’t have to season it yourself right out of the box. But what is cast iron good for? Well, a bit of everything, really! It can be used wherever you like: On the stove, in the oven, even over a campfire, should you want to cook in the great outdoors. And it can even last decades. The only downside with cast iron is that it isn’t easy to care for: You will always have to hand-wash it, and then re-season it with cooking oil. Made of cast iron, which is extremely durable and long-lasting. This skillet could feasibly last decades! Can be used on the stove, in the oven, or even over open flame. This pan is large, and can be used for any number of different recipes. With an average Amazon price of $37, you probably won’t find cast iron any cheaper. It’s not dishwasher safe. You have to hand-wash this skillet, then re-season with cooking oil. It isn’t nonstick, so you’ll need to add plenty of oil or butter to keep food from sticking. If you want something that is going to last for years, can cook almost anything, and can be used almost anywhere, the Lodge Cast Iron Skillet is a great choice. It’s a cheap one, too, as you likely won’t find cast iron cheaper anywhere else. However, if you want something nonstick and easy to care for, this isn’t for you. When choosing a sauce pan, normally the best option is to go for one that can be used for a great many things. That’s one reason that the T-fal A85724 Specialty Nonstick Sauce Pan is such a good choice if you’re looking for cookware that is a real do-anything kind of piece. As the name suggests, the interior is made so that it is completely nonstick, making it a great choice for those who want to eat healthier, as well as for those who are new to cooking: You won’t need to use oil or butter, and it’s very forgiving. It is made out of aluminum, and is oven-safe up to 350 degrees Fahrenheit. There is an included, vented glass lid, to observe what you’re cooking. However, the lid is one of the few problems some people have with this sauce pan. It can apparently trap water, making it a bit of an annoyance to use. 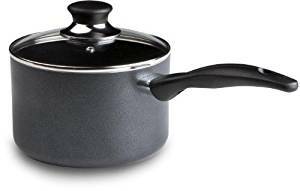 It has a very nice nonstick interior, so it’s great for healthy cooking or just everyday cooking in general. It is oven-safe up to 350 degrees Fahrenheit. Completely dishwasher safe for easy cleanup after use. Has a large, 3-quart size, useful for cooking almost everything. The vented glass lid can trap water, and it can be difficult to get rid of this water. The handle can become loose after use, making it more difficult to handle the sauce pan. This sauce pan cannot be used for induction cooking. 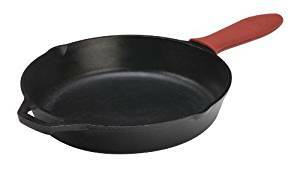 If you’re looking for a basic sauce pan that can do almost anything, the T-fal A85724 Specialty Nonstick Sauce Pan is a great choice here. Though it can’t be used for induction cooking, and there are a few minor issues, its size, nonstick coating, and easy cleanup are redeeming qualities. For frying pans that prove that aluminum can be durable, you need not look any further than the All-Clad E785S264 HA1 Hard Anodized Nonstick Cookware Set. The hard anodized aluminum that makes up these two pans are very hardy. You can use both of these in the oven up to 500 degrees Fahrenheit, without the lids. Both can also be used for induction cooking and are dishwasher safe, though hand-washing is still recommended. But the best part about these pans is the great deal that you get when you purchase them. 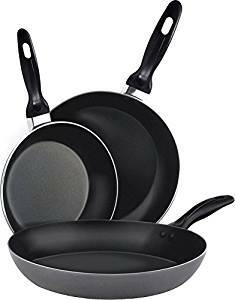 For the average Amazon price of $48, you get not one durable pan, but two: One ten inch pan, as well as one eight inch pan, for more use. It’s a huge bargain, considering that some pans cost more than this and, then, you still only get one pan. The set comes with two, so you can stock your kitchen with frying pans with just one purchase. Completely nonstick, for easier cooking and cleaning. Oven safe up to 500 degrees Fahrenheit. Can be used for induction cooking. One pan is 10 inches, the other 8 inches. Some find that the handle is a bit flimsy, increasing the difficulty needed to move this pan, especially while you’re cooking. Though it is technically dishwasher safe, it is still recommended that you hand-wash the frying pans, making it a bit more to clean up. For those who are looking to completely stock up on frying pans with just one purchase, the All-Clad E785S264 HA1 Hard Anodized Nonstick Cookware Set is a great choice. With a rough price of just $48, you get not one, but two frying pans. While they have their small issues, they’re very sturdy and easy to use. Copper has long been used in cooking dishes, and for good reason: It’s a natural, safe way to keep food from sticking. If that’s your main concern, then you’ll find that the Cooksmark Copper Pan 10-Inch is a great choice for you! While the exterior is made out of a mixture of sturdy aluminum, for more even heating, and a strong stainless steel base, to allow for induction cooking, the copper interior is what really draws people to this pan. It seems to work well, and many show that it is as nonstick as it claims to be. There are, however, a few downsides to this pan. For one, the handle isn’t very ergonomic: It’s narrow, and some find it to be too sharp to comfortably use one-handed. Another problem is that it requires delicate cleaning; hand-washing only with a gentle sponge. Lastly, the sticker that comes in the middle. For some, that rendered it useless. Is capable of induction cooking. Copper is a safe way to provide a nonstick coating. Heats evenly with the aluminum center. Oven safe up to 450 degrees Fahrenheit. Has a hanging loop for easier pan storage. The handle isn’t very comfortable to use one-handed; it’s too narrow and sharp. This pan has to be taken care of very carefully: Only hand-washing, and only with a gentle sponge. Best to use silicone utensils with this pan. The sticker in the center of the cooking surface can be difficult to remove. The science behind the Cooksmark Copper Pan 10-Inch is true. Copper is a good way to achieve nonstick results without chemicals or added oils or butter. And the pan itself seems to work as advertised, making it a good choice for cook-tops of all kinds, including induction. It even works in the oven! But, it is fairly delicate when it comes to caring for it, the handle is uncomfortable, and the oddly-placed sticker is a bit much. 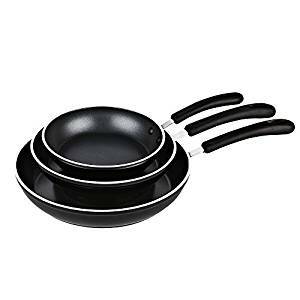 The most promising thing about the Utopia Kitchen Aluminum Nonstick Frying Pan Set is the fact that it is, indeed a set: It comes with three different frying pan, each of different size. In this case, the sizes are 8 inches, 9.5 inches, and 11 inches, which is a decent range for someone looking for a set that can handle more diverse cooking needs. The second most promising? The price. In this instance, the price is very low, especially considering that you get three frying pans. The average on Amazon is anywhere from $22 to $50, making it nothing short of a steal. However, the reason behind this is likely that the frying pans are made out of lesser quality materials. They’re also more delicate, requiring a lot of care when being washed. They’re not induction ready, and they can’t be used in the oven. Each set comes with three frying pans. Frying pans come in varying sizes: 8 inches, 9.5 inches, and 11 inches. Has a two layer nonstick interior for easier cooking. Has a Bakelite handle, for easier maneuvering. Can’t be used in the oven for any reason. Requires more care when in use; it’s best to use wooden or plastic tools, instead of metal. Takes more care when being washed, also. Though dishwasher safe, there are a litany of rules to follow when hand-washing. Can’t be used on induction cook-tops. The Utopia Kitchen Aluminum Nonstick Frying Pan Set is an amazing choice if you’re only looking for the most frying pans that you can get for the price. However, if you’re wanting quality, ease of use, or an easy-to-care-for pan, this isn’t it. It’s high maintenance and, honestly, not quite worth the price. When it comes to name-brand kitchen appliances and cookware, there’s little doubt that the crown belongs to Cuisinart. That’s likely to be one of the big reasons that a lot of people initially choose the Cuisinart 622-30G Chef’s Classic Nonstick 12-Inch Skillet. This skillet is, as the name suggests, a Cuisinart product. It’s also twelve inches in diameter, making it a great sized skillet, even without the name brand. The price, however, for such a name brand is definitely a good call: Only approximately $34 for this pan. Though it can’t be used for induction cooking, it can be used on almost any other cook-top. Want to use it in the oven? It works for that, too! It’s safe at temperatures up to 500 degrees Fahrenheit. The interior is completely nonstick, and made out of quantanium, which is reinforced with titanium. The interior is made out of quantanium, which is reinforced with titanium, to prevent food from sticking. Twelve inch skillet is the perfect size for a number of different uses. Can be used in the ovens at temperatures of up to 500 degrees Fahrenheit. The handle stays cool even when the skillet is being used. You can’t use this skillet for induction cooking, because it’s made out of aluminum. The lid isn’t vented, so this skillet can boil over if left unattended. Best to use wooden or silicon utensils while cooking. For those who are looking for a big-name skillet that can do its job, you can’t go wrong with the Cuisinart 622-30G Chef’s Classic Nonstick 12-Inch Skillet. It’s large enough to do a lot, it has all of the features you’re likely to need, and is even nonstick. However, it doesn’t have much else going for it; it’s very basic. 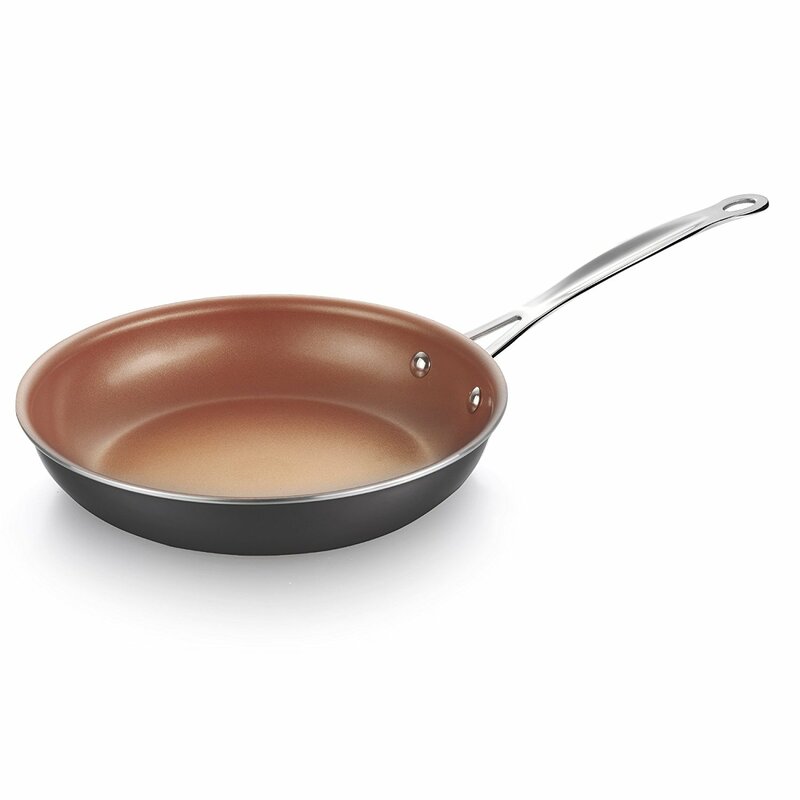 At first glance, the Copper Chef 9.5″ Square Fry Pan seems like a good pan to purchase. It claims to be made out of copper, and offers CeramiTech nonstick coating, to keep food from sticking and to cut back on the oil and butter needed to cook using this pan. As a bonus, it is capable of induction cooking, and seems to look absolutely beautiful. However, upon a bit of investigating, it’s quite obvious that this pan doesn’t hold up once it’s actually in use. The biggest problem seems to be with the nonstick interior. Namely, the nonstick actually does stick. Quite badly, according to most of those who use this pan. It’s also been found to be made out of cheap materials, meaning that the pans won’t last very long compared to others. But, for an average Amazon price of $20, it can be said that you get what you pay for. The price is fairly low, at just roughly $20 on Amazon. 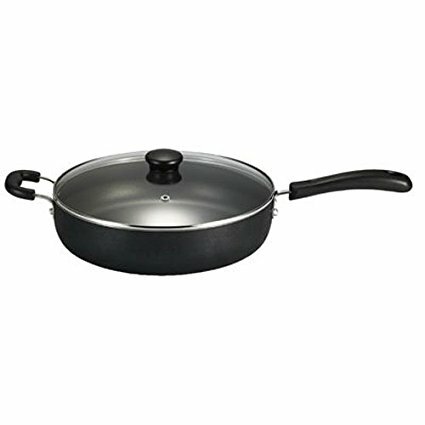 This pan is capable of being used on induction cook-tops. 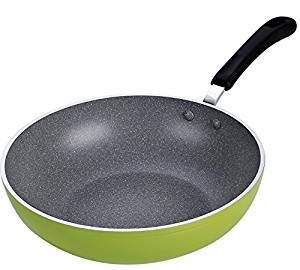 This pan claims to be nonstick, but most consumers find that it sticks quite heavily; it’s as though there were no nonstick coating at all. The materials making up this pan are cheap, even for the low price of the pan itself. It claims to be heat resistant up to 850 degrees Fahrenheit, but those who use it claim that it warps at much lower temperatures than that. 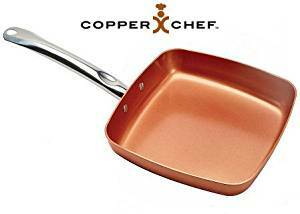 The Copper Chef 9.5″ Square Fry Pan is not one that you should consider buying. While it might seem like a good bargain up front, this pan isn’t a good piece of cookware for you to use. There are better, cheaper pans out there, and you would be better off with one of those. Are you looking for a big, but basic pan for a good price? Do you want something that’s nonstick, easy to use, and sturdy enough to handle almost anything? Then you will definitely enjoy the Cook N Home 12-Inch Stir Fry Pan! This pan is a great solution, especially for small households where not much else is needed. This pan is deep and large, but, if you’re not cooking a heavy dish like soup or stew, can be easily lifted and moved with one hand. That’s right: It’s not just a stir fry pan! This deep pan can be used for so many other things. The price is great, too, at approximately $20 on Amazon. The nonstick surface is made out of ceramic, so that you don’t have to bother being ridiculously easy on it. The only issue that should be noted is that it doesn’t work on induction cook-tops. Deep enough for soups and stews. 12 inch size is great for a variety of different jobs. Has extra thick gauge material for superior heat control. Handle is very comfortable to handle, and will stay cool, even while you are cooking. Low price of just $20 average. Though it works on most other stoves, if yours relies on induction cooking, this isn’t the pan for you. If you’re looking for the best pan for the price, the Cook N Home 12-Inch Stir Fry Pan is probably going to be it. Perfect for almost anything, very simple to use, and very sturdy. Particularly useful for those who don’t need a lot of cookware, but just want the basics. For many, finding a good, inexpensive set of cookware is more than a bit difficult. For those trying to find a set that will work with induction cook-tops and stoves, it goes well beyond difficult. But with the Cook N Home 3 Piece Frying Pan/Saute Pan Set, you can get all of that and more, all for a very low price that you aren’t likely to find with other sets. This set, as the name suggests, comes with three frying pans that also work as sauteé pans. You get one 8 inch pan, one 10 inch pan, and one 12 inch pan, perfect for those wanting to get the whole set at once. Do you have an induction cook-top or stove? Then these are some of the most inexpensive pans you can get. How inexpensive? You can get the entire set of three for an average Amazon price of $32. The set comes with three pans: An 8 inch pan, a 10 inch pan, and a 12 inch pan. The cost is only approximately $32 on Amazon, making it a bargain for all three pans. Can be used on induction cook-tops and stoves. Oven-safe up to 350 degrees Fahrenheit. Two layers of nonstick coating. The 8 inch pan is 1.7 inches deep, the 10 inch pan is 2 inches deep, and the 12 inch pan is 2.2 inches deep; for a stir-fry pan, they could be deeper. This is likely the best, most inclusive frying pan set that you’re going to find on this list. It’s also most likely the best bargain, as well. At only $32, this is a set that you can’t really afford to be without. If you want an all-inclusive set for cheap, this is it. There is a lot of variation in what you can look for and expect when it comes to cookware. It can be good or bad, cheap or expensive, or anywhere in between. With this list, hopefully you’ll find choosing the right cookware to be a bit simpler than it was before.